That mini solar system that some call ‘Planet X, is coming. 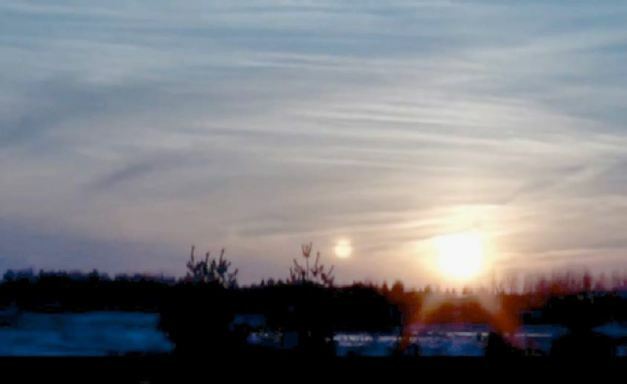 It’s visible in some locations, at sunrise, or near sundown in the skies above the earth. Not to formally inform the global-population. Meanwhile the global cabal is planning to use the confusion and possible panic, to what they think of as their political-advantage. How much of that is prefigured in moving the start date for JADE HELM forward by a full month, can only be speculation at this point, but the rest of the instances of ‘secrecy’ and government movements seems to be clearly be in service to something related to the passage of Nibiru between the earth and the sun ­ which is something it has been doing for over thirty-five hundred years, due to its wide ranging orbit with our sun—all of which seems to be what is critical to the number of times the earth has undergone planetwide pole shifts, down though history. Here in the blissfully ignorant USA, most people seem to still be unaware of whatever might be coming. Those who are watching the military purchases of weapons and ammunition by the illegal mercenary Obamanation army, have wondered what all that ammunition will be used for? The same can be said of all the weaponry, the vehicles, tanks and guns that are obviously being stockpiled. Many have noticed the markings on many vehicles to indicate that they are the property of the UN. This causes many to remember the North American Union and the threat of a military takedown that was broached a few years back; fueled by mysterious underground cities buried beneath the new Denver Airport and elsewhere throughout the nation. U.S. Government Inc. has made no secret of the fact that “something big is coming” and it was the government itself who announced JADE HELM and then increased the length of the exercise while bumping up the start date to the fifteenth of June. Some might think that whatever it is might be related to the news released yesterday about the military plan which was supposedly triggered by the attack on 911, which also just happened to trigger a secret declaration of war against 92 countries, just 4 days after 911 became a fact? “…The letter was part of a cache of previously classified documents including a nearly 500-page CIA Inspector General’s report that documented many “systemic problems” in the US intelligence services before September 11 attacks”. However since no one has yet gone to jail for any of the activities on 911, it seems doubtful that ordinary people in the U.S. will care enough to demand any real change in the status quo ­ given the number of the victim’s families who already took the money and walked away without bringing any charges, against whoever was responsible for the deaths of nearly 3,000 people. Also this government knew the information about 911 would be made available, because it was under seal and they were aware of when the facts would have to be revealed: So that potential ‘flashpoint’ doesn’t seem quite strong enough to trigger a nationwide revolt. Meanwhile planetary monitoring sites are registering huge increases globally, in volcanic activity all over the planet which seems to be intensifying. Similar activities seem to taking place where earthquakes and shifting tectonic plates are involved, which might indicate further disturbances in the deep earth forces of the planet and some possible disturbances that might directly impact real changes in the globe on which we live. “Reversals are the rule, not the exception. Earth has settled in the last 20 million years into a pattern of a pole reversal about every 200,000 to 300,000 years, although it has been more than twice that long since the last reversal. A reversal happens over hundreds or thousands of years, and it is not exactly a clean back flip. Magnetic fields morph and push and pull at one another, with multiple poles emerging at odd latitudes throughout the process. Scientists estimate reversals have happened at least hundreds of times over the past three billion years. And while reversals have happened more frequently in "recent" years, when dinosaurs walked Earth a reversal was more likely to happen only about every one million years”. The quote above comes from NASA a completely coopted government agency but it does give us an approximation of the time frame for pole shifts. Couple this continuing situation globally with the appearance of this ancient “X factor” that’s been known here for three decades but has now become visible to the people of the planet, ergo this would seem to be “the threat” which this facile government still refuses to define or describe. It might appear to those who have been watching this Outlaw Empire at work, that since ‘the Powers that want to be Imperial’ began their quest to kill the people and steal the planet for themselves ­ and since they’ve known about this perilous and potential “Pole Shift” that might be coming now: Maybe they’ve decided not to warn the public about what might be coming now, maybe they’ve decided to take full advantage of the ensuing panic globally to let nature finish killing off the 95% of the current population; while they try and ride this out in any of their supposedly “secure-locations”? A few things are certain. First the creatures running U.S. Inc. are terrified of the public. They hate us and they want us dead. Secondly it’s clear from how they managed “the public” in Hurricane Andrew and Hurricane Katrina, exactly how the so-called government feels about any real problems which any members of the public might have to face in any natural disaster, whether real or made-made and that too is also a certifiable fact. Multiply that out by the increase in fear and death that a possible magnetic pole reversal of the planet might bring with it, and know that this should qualify as the problem in these next three months for that “SOMETHING BIG” - which this so-called government keeps on ‘NOT-TALKING’ about.